Maybe you don’t know this, but the first post I ever did for this blog was a craft post on how to make Homemade Paper Lanterns. 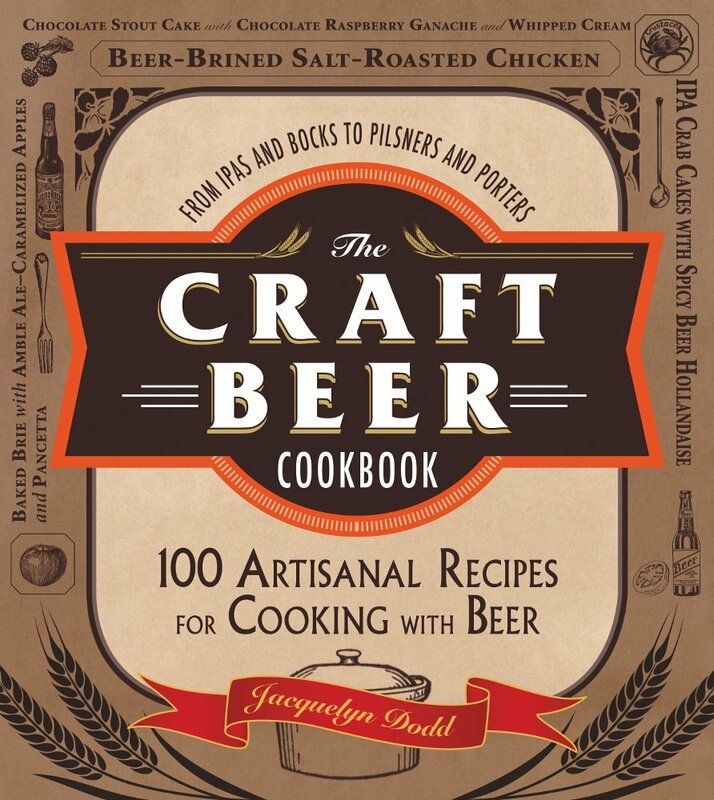 It wasn’t too much longer that I was sucked into the food blog scene and haven’t really looked back. I do still love to get my crafting hands dirty, and this little DIY is so easy, I hope you forgive me for my break from those food posts I love so much. 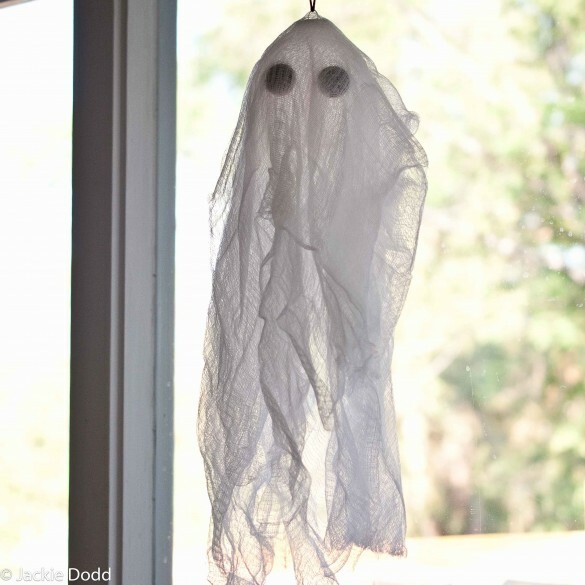 Make a dozen or so to hang from your trees on Halloween, they turned out a little creepy in the best way. Remove the metal top from the ornament. 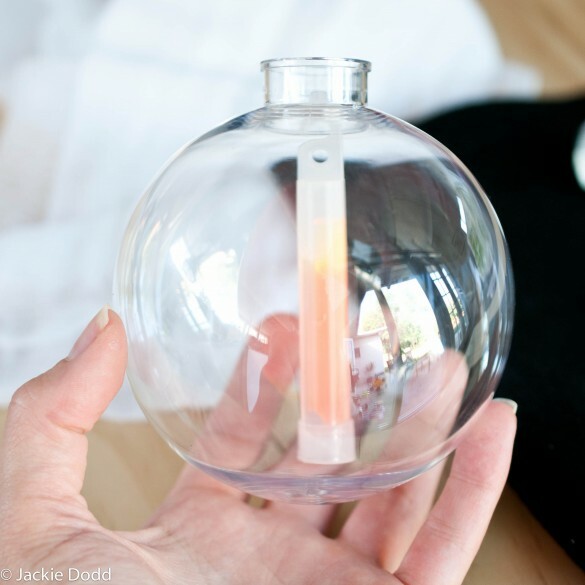 Place the glow sticks inside (but wait until dark to break the glow stick). I found that two or three work better once its dark. 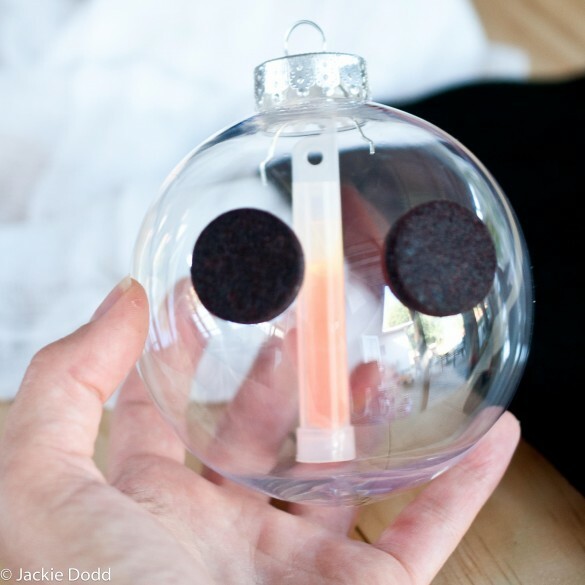 Add the black felt stickers (or cut out circles and glue them) to the ornament to resemble eyes. Cut the cheese cloth into 2 foot strips. You can also cut it into various lengths to add a bit of dimension. 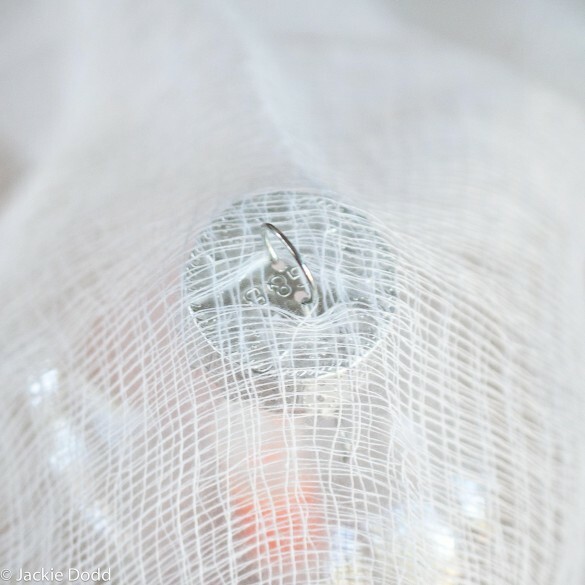 Layer the cloth over the ornament and push the metal ring through the cloth. That’s it, takes about 5 minutes. And night time creepy ghost. I love diy craft stuff! I definitely need to make this with my little niece – she’s going to be so thrilled! Yay…something to Pin to my Creepy, Crawly, Spooky Stuff board on Pinterest 🙂 I’m totally obsessed with Halloween and LOVE this post. What a fun and easy decoration to make with your kids! These are so fun!! And so easy! These ghosts are so cute! They are going to look great hanging around in the front yard for Halloween! Thx! Stop it! This is so cute, and so easy! I’m kind of in love. cheap wow its like Halloween craft gold! 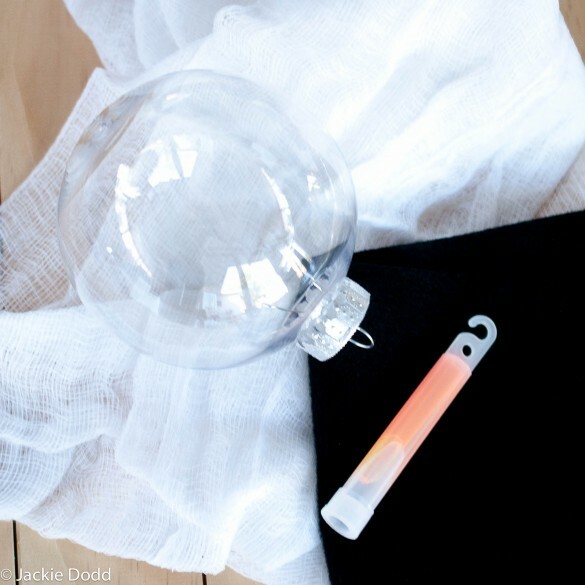 Cute project and sooo easy pesy….but How long glow sticks last? It depends on which kind you buy. It should say on the package. After having a freakout about how I was going to make all the decorations I need to fill my huge yard for my Halloween party, I found this post. LOVE them, and was able to make 30 in just about 15 minutes. All ready to go, can not wait to see them all lit up at night! So cute! 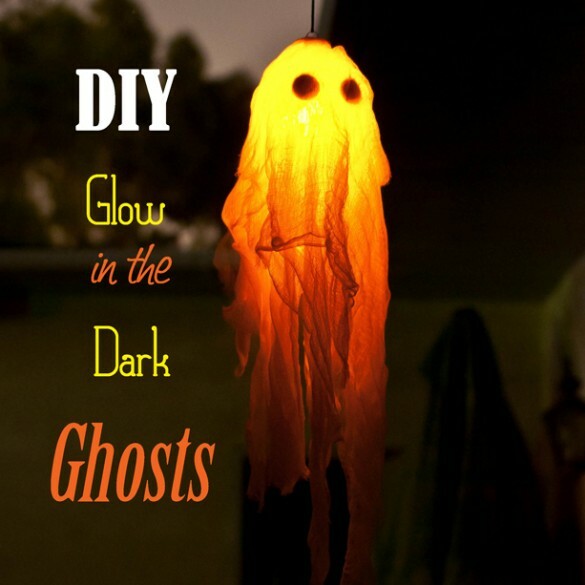 Making these for my Halloween party! SO much fun! Just added this to my Halloween pinterest board. Can’t wait! i just love it! definatly going to one of my projects!! I just finished making my first one of these. 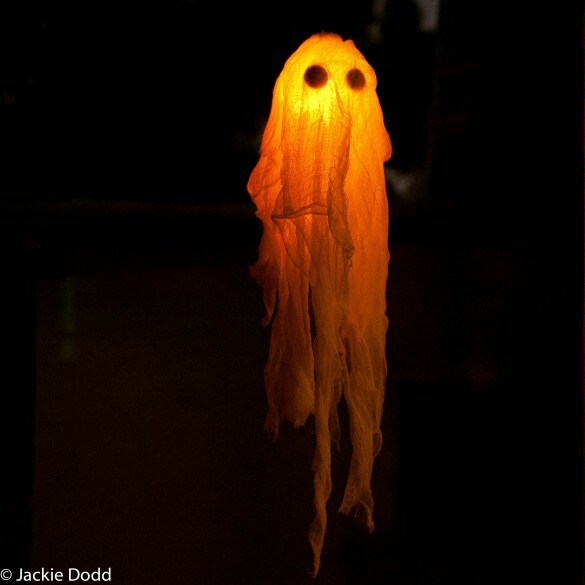 So cute but you can see the glow stick right thru the cheese cloth. I have 3 layers of cloith even place some spider webbing over the ornament. Can still see thee exact shaspe of the glow stick. It’s worse in the dark. Help??? ?